"This is an eggy, cheesy breakfast casserole with an identity crisis. Is it Italian, Greek, Tex-Mex? Who cares. It tastes great. 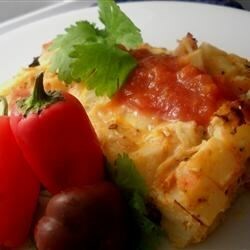 It has the standard ingredients of eggs, cheese, and hash brown potatoes seen in most breakfast casseroles. However, it is a fusion of different spices from cuisines around the world which are added to the traditional American breakfast casserole. It can be made ahead, refrigerated overnight, and then put in the oven the next morning. Add bacon, sausage, or ham for a hearty breakfast dish." Spread potatoes into the prepared baking dish; sprinkle with 1/2 teaspoon black pepper. Mix eggs, Italian cheese blend, onion, pico de gallo, 1/2 teaspoon black pepper, Greek seasoning, and cayenne pepper together in a bowl; pour over potatoes. Bake casserole in the preheated oven until lightly browned and eggs are set, about 40 minutes. You substitute the eggs with 1 1/2 cups egg substitute (such as Egg Beaters®). Easy to prepare. I used more eggs and let it cook about 15 minutes longer until it was not runny. Easy to change ingredients if you want different flavors depending on your needs. I used Mexican cheese blend instead of Italian . It should be cooked an hour instead of 40 min. as potatoes do d not seem done enough.